Obama's official First Lady portrait is in a the type of sleeveless attire she is known for. 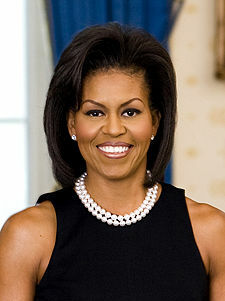 Michelle LaVaughn Robinson Obama is the wife of the forty-fourth President of the United States, Barack Obama, and the first African-American First Lady of the United States. Obama, née Robinson, was born and grew up on the South Side of Chicago and graduated from Princeton University and Harvard Law School. After completing her formal education, she returned to Chicago and accepted a position with the law firm Sidley Austin, where she met her future husband. Subsequently, she worked as part of the staff of Chicago mayor Richard M. Daley, and for the University of Chicago Medical Center. Throughout 2007 and 2008, she helped campaign for her husband's presidential bid and delivered a keynote address at the 2008 Democratic National Convention. She is the mother of two daughters, Sasha and Malia, and is the sister of Craig Robinson, men's basketball coach at Oregon State University.